Llawhaden Castle was constructed in the 12th century to protect the lands owned by the bishops of St Davids in Pembrokeshire. The castle was destroyed in 1192, but rebuilt in the late 13th century. The guidebook by C.A. Ralegh Radford contains a standard history, followed by a description divided into sub-sections. A plan of the castle was placed on the centre pages. The Bishop’s Palace at Lamphey in Pembrokeshire is now in the care of Cadw; the remains were placed in State Guardianship in 1925. The origins of the house lay in the Norman occupation of south-west Wales. Bishop Henry de Gower (1328–47) expanded the palace. The estate was handed over to the crown at the time of the Reformation. C.A. Ralegh Radford prepared a simple paper guide in 1948. It contains a history and a description, with a double page plan in the centre. St Govan’s Chapel in Pembrokeshire is set in a fold of the sea cliffs. The present chapel probably dates to the 13th or 14 centuries, although the name suggests a possibly earlier foundation. The chapel is accessed via the Castlemartin firing ranges. We would like to wish all readers of Heritage Futures Dydd Gŵyl Dewi Hapus (Happy St David’s Day). The former Bishop’s Palace is in the care of Cadw. The burial chamber of Carreg Coetan Arthur lies on the east side of Newport in Pembrokeshire. The monument is in the care of Cadw. It was excavated in 1979 and 1980. A Cadw guide was prepared by J.B. Hilling (1992). This is omitted from the earlier list of Cadw guides to burial chambers in Wales. Today is the national day to celebrate Dewi Sant. The Bishop’s Palace (now under the guardianship of Cadw) is adjacent to the cathedral in St Davids, Pembrokeshire. The palace was enhanced by Bishop Henry de Gower in the 14th century. In the foreground is the entrance to the Bishop’s hall. The arcading along the upper part of the hall is echoed in Swansea castle. The logo of Cadw incorporates the head of the eleventh century cross at Carew in Pembrokeshire. 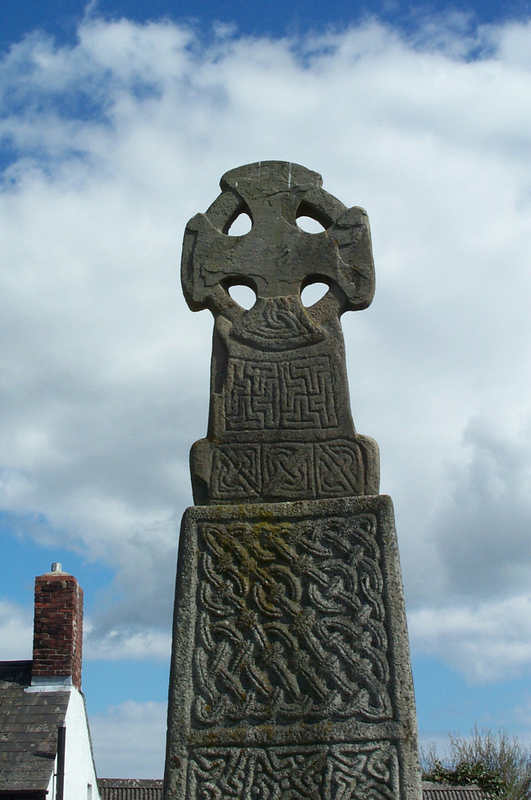 This cross has a Latin inscription linking it to Maredudd, ruler of Deheubarth. This is one of a number of stones in the care of Cadw. The largest collection can be found in the Margam Stones Museum.